Reza Nasri is an Iranian international lawyer and foreign policy analyst who writes opinion pieces about international law, international relations, foreign policy, security, and the Iran nuclear deal. 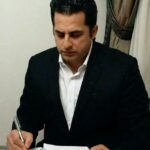 Reza Nasri, an international lawyer and foreign policy analyst, says US President Donald Trump’s withdrawal from the Iran nuclear deal and his re-imposition of US sanctions on Tehran are mainly aimed at spoiling the legacy of his predecessor Barack Obama. Iran should capitalize on the International Court of Justice’s ruling against the US, urging Washington to implement it as a precondition for beginning of any bilateral talks.